Agenda. Our workshop will bring together a number of experts working on "expansions" and a number of experts working on "invariants" in the hope that the two groups will learn from each other and influence each other. "Expansions" are solutions of a certain type of intricate equations within graded spaces often associated with free Lie algebras; they include Drinfel'd associators, solutions of the Kashiwara-Vergne equations, solutions of various deformation quantization problems, and more. 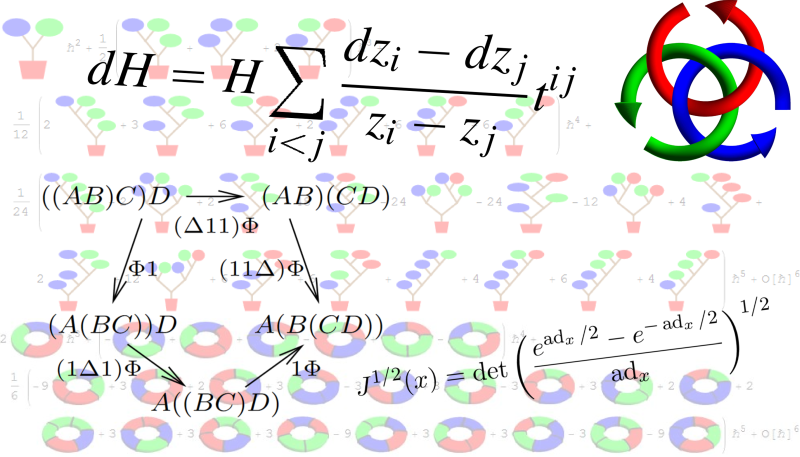 By "invariants" we refer to quantum-algebra-inspired invariants of various objects within low-dimensional topology; these are often associated with various semi-simple Lie algebras. The two subjects were born together in the early days of quantum group theory, but have to a large extent evolved separately. We believe there is much to gain by bringing the two together again. Plan. In the first week (July 2-5) the organizers will give some introductory talk, explaining why we are here. 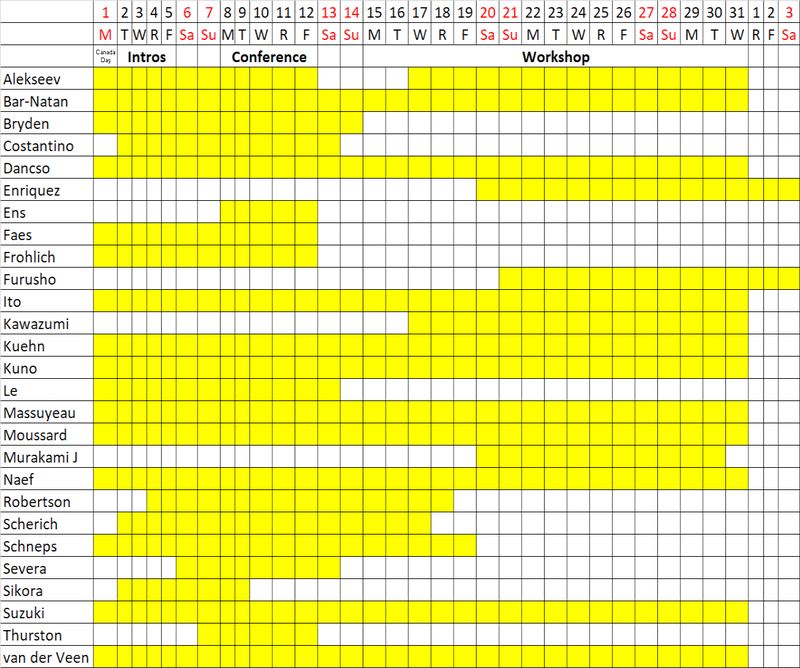 The second week (July 8-12) will be "conference"-style, albeit with relatively few and long talks. The remainder of the time (July 15-31) will be in workshop style. Speakers. Francois Costantino, Zsuzsanna Dancso, Benjamin Enriquez, Hidekazu Furusho, Tetsuya Ito, Nariya Kawazumi, Ulf Kuehn, Yusuke Kuno, Thang Le, Gwenael Massuyeau, Delphine Moussard, Florian Naef, Leila Schneps, Sakie Suzuki, and Dylan Thurston. Participants. We have limited funds to offer partial financial support to some further visitors, with emphasize on graduate students and post-docs. If you are interested please contact one of the organizers and include the dates of your proposed visit, a quick description of your needs, your CV, and if relevant, a one-paragraph letter of reference from a more senior mathematician. Please apply by May 15; we hope to finalize our support decisions shortly after that.